The Super Bowl has been transformed into the biggest cultural event in America over the years. It’s much more than just a little football game in modern culture. Even people who aren’t football fans (they do exist) have the halftime show and the commercials to draw them in. And for the degenerate gamblers out there, there are, of course, the legions of prop bets. No game has as many interesting, hilarious, and downright absurd prop bets like the Super Bowl does. There are many sites that offer any kind of prop bet that you could imagine existing. Want to bet on the color of Jay Feely’s tie? Go for it. But for our consideration, we’ve tried to keep it mainstream with the list put together from Bovada that covers everything from the national anthem to the Gatorade shower to Tony Romo’s wizardry. 1) Will any scoring drive take less time than it takes Gladys Knight to sing the National Anthem? Betting on the length of the Super Bowl National Anthem is the most basic of Super Bowl prop bets. This year the over/under is 1:47 for Gladys Knight. But why not add an extra element of intrigue by actually tying it into the game and seeing whether or not there will be a scoring drive that takes less time than the anthem itself? Given the quick-strike and big-play ability of both the Patriots and Rams offenses, it might be worth a punt. 2) How many plays will Tony Romo correctly predict ahead of the play? It’s weird to try to judge this on anything more than a purely subjective basis, but Tony Romo’s analyst performance during the AFC Championship Game may have been one of the best in the history of broadcasting. Romo basically walked viewers down the field, calling out nearly everything that was going to happen beforehand. The former Cowboys quarterback has amazed fans with his ability to read and predict offensive plays and strategies, but this was on another level. Can he duplicate it in the Super Bowl? Of course he can, but a lot will depend upon the flow of the game and how long it stays close. You can decide on your own whether or not you want money on Tony Romo coming down the stretch of a close game. 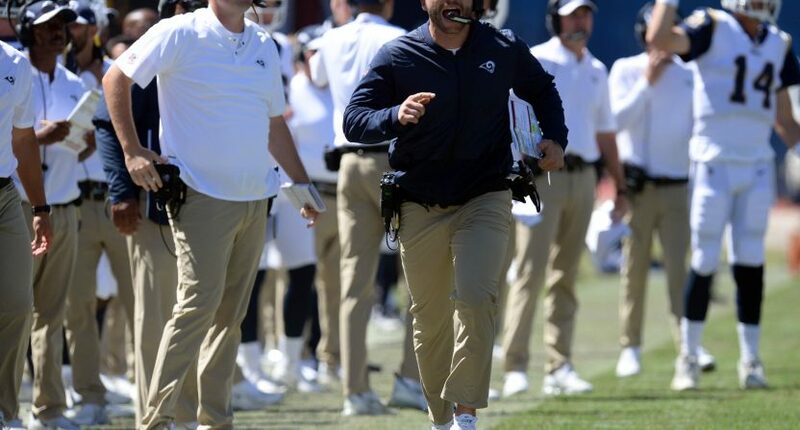 3) How many replays will be shown of Ted Rath holding Sean McVay back during the game? Rath will probably get at least one look given how widely his story was shared, but the second mention might be a bit of a stretch, so the under seems like the safe bet. Of course, if the Rams get multiple suspicious pass interference penalties called against them for some reason, it may be a different story. 4) What will happen to the price of Bitcoin (BTC) during the Super Bowl? Betting on the stock market after the Super Bowl is such a nineties thing to do. Now you can enter the future and bet on the price of Bitcoin! Because what could be more stable and predictable to try to bet on than Bitcoin? In case you’re wondering, Bitcoin has been facing a bear market in recent times, so maybe it’s due for a turnaround? Your guess is as good as anyone else’s. 5) What color will the liquid be that is poured on the game-winning coach? Believe it or not, there’s actually a traceable history when it comes to Gatorade showers and Super Bowl-winning coaches. And while we don’t have a historical record of Sean McVay getting doused with Gatorade after winning a championship, we do with Bill Belichick. In what will come as totally no shock whatsoever, Belichick has avoided the Gatorade shower more times than he has received it. Would you really want to be the player to explain that to him afterwards? Belichick got blue drink after winning Super Bowl 49, and Doug Pederson received yellow last year, so those would seem to be decent bets in looking for a potential pick. 6) What will the Super Bowl champions be served when they visit the White House? It’s still hard to believe that the fast food smorgasbord served to the Clemson football team at the White House was actually a real thing that happened and not an SNL skit left on the cutting room floor. It’ll be harder to believe if we ever see it duplicated. For starters, hopefully we don’t have to endure another government shutdown. Moreover, Trump and Tom Brady are notorious for being pals so Trump is likely to roll out the red carpet if the Pats do indeed win. Given Brady’s weird eating habits, I doubt you’ll find anything on the McDonald’s dollar menu that will really sit well in his stomach. 7) Will Mark Wahlberg attend the game and leave early? Patriots fan and actor Mark Wahlberg famously left Super Bowl LI before the Patriots’ historic comeback against the Falcons. Wahlberg may have more than just a rooting interest in this one though, as it was reported by Page Six during the summer that he has a sizable bet on the Pats to win Super Bowl LIII. For the bet to record a “yes,” he has to make it to the four-minute mark of the fourth quarter. You can do it Marky Mark! 8) Will a non-QB throw a touchdown? The Patriots were partly undone last year by the Philly Special, when Nick Foles caught a touchdown pass from tight end Trey Burton. As much fun as it might be to think about Brady trying to return the favor and racing out to catch a pass, the odds here may be pretty short. A non-QB has thrown a touchdown pass only four times in Super Bowl history, including last year. 9) Will a fan run onto the field during the game? Yes, you can actually bet on whether or not someone will commit a misdemeanor in front of tens of millions of viewers! Of all the prop bets in the world, this might be the actual definition of degenerate gambling. Why not go for a “yes” just for the banter? 10) Will Maroon 5 play “Sweet Victory” at halftime as a Spongebob Squarepants tribute? There are so many compelling storylines for this Super Bowl – Brady vs Goff, Belichick vs McVay, NFL Referees vs the Saints, but the most intriguing subplot might just revolve around… Spongebob Squarepants? A petition calling for the SpongeBob song “Sweet Victory” to be played during the halftime show in tribute to the late creator Stephen Hillenburg has gained over 1 million signatures online. Halftime act Maroon 5 actually acknowledged this by including an image of Spongebob in a hype video they put out on social media. If Janet Jackson’s wardrobe malfunction and Left Shark can happen during a Super Bowl halftime show, then why not this?